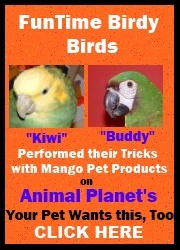 Like the 1950's hit by Jerry Lee Lewis this bird toy will become a classic with your feathered friend. Our Umbrella Cockatoo "Marshmellow" loves to nibble on the plastic characters and Wiffle Balls and then she is on her way for a big time wood chew. Bird toy measures: 21" Long and 7" Wide and contains 2 plastic Wiffle Balls, Extra, Extra Large Wood Blocks, and 16 Jurassic Characters strung on 2.5mm chain. Great Balls of Fun Cockatoo/Macaw Parrot Toy5KimMarch 23, 2015Oscar absolutely LOVED this toy. Haven't had it long. I hung it in his cage when it came and the next day all the plastic critters were chewed off. It keeps him entertained and quiet!